The fashion designer is never allowed to rest as it would seem. 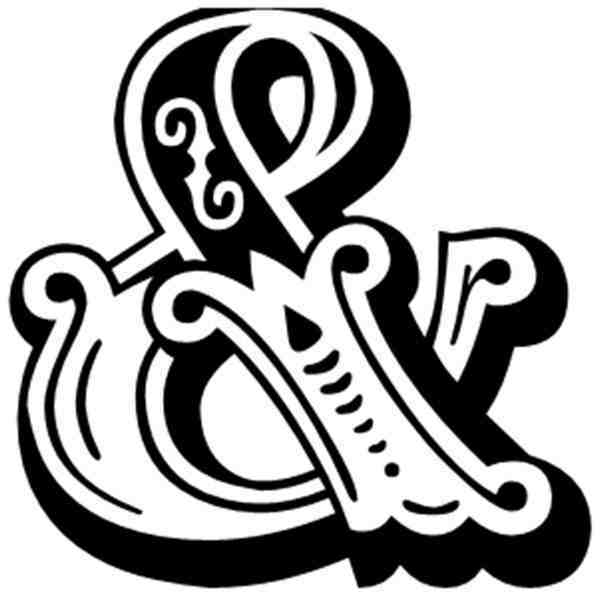 Now it is the done thing to produce a pre-range or resort collection before the main collection. It has been done for many years but this pre-spring summer 2013 seems have dragged the majority of designers with it this time. Resistance is futile. Alexander Mc Queen brings us flaired trousers, beauitful embelished gowns and the drangon fly. Belts are decorated with chunky chain to match each outfit and shoes are wonderful, such attension to detail, putting the collection in a place where it can not be coughed at, well done Sarah Burton. Marc Jacobs dazzles us with colour. Flower power, metallic shine and block coloured are mis-mashed together, to give us a fresh and youthful, care free look. A little hippish I feel because of the patch work thing. Again the shoes are tip top, bold colour, chunky heels. Diane Von Furstenburg resort collection screams modern suburbia, over sized blazers, soft jersey shapes, clashing colours and modern graphic print. I love this Moschino dress, unmistakably art deco inspired. Then it runs away into another period in history, very eclectic. As fun as ever, very elegant and girly. Tunics over cigarette trousers have made a few appearances what could this mean for us all I wonder. 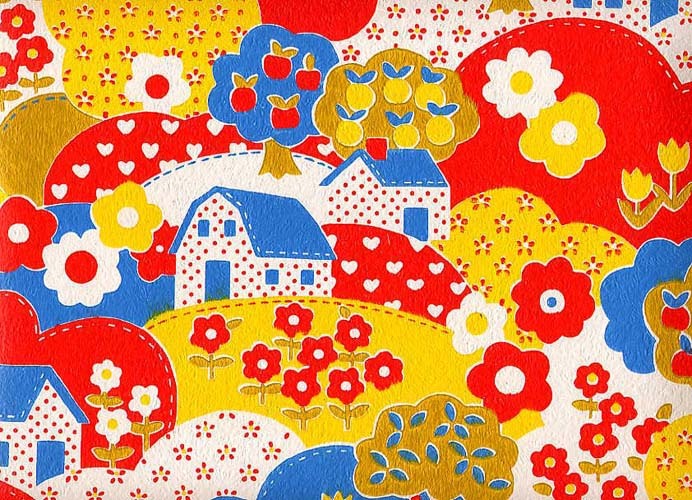 Suzanne Lipschutz is mad about wall paper and makes me believe we all should be. 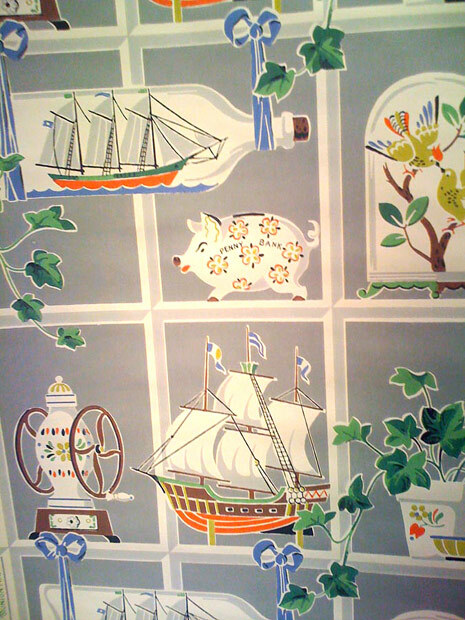 Suzanne's shop; Secondhand Rose, in New York stocks reams of the finest and most unusual old wall paper from across the world. The rich, famous and creatives have come to her to find inspiration for film sets right through to the new nursery and I'm sure they all came away in brimming with rolls of paper in hand. Click on the link below for an interview with the lady in questions and hear her gravely voice talk about about her obsession for wall paper. I like the way she finds imperfections in prints so desirable and her obvious enthusiasm for wall paper. Prager uses colour, pretty ladies, good clothes, interesting scenes to create mighty fine original photographs. Born in LA in 1979 Prager has a number of solo and collaborative exhibitions in the USA and UK. Prager also makes short films, the most recent being La Petite Mort. Her picture are quirky, full of life and you could easily be present whilst the image was taken. They are believable and real some how. 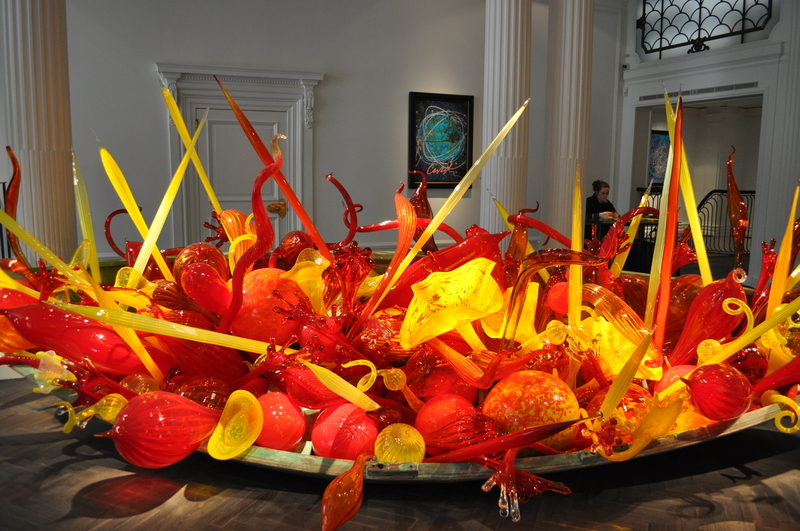 On a recent trip to London I stumbled across a Dale Chihuly exhibition at the New Halcyon Gallery on New Bond Street(a beautiful space by the way). It was amazing. 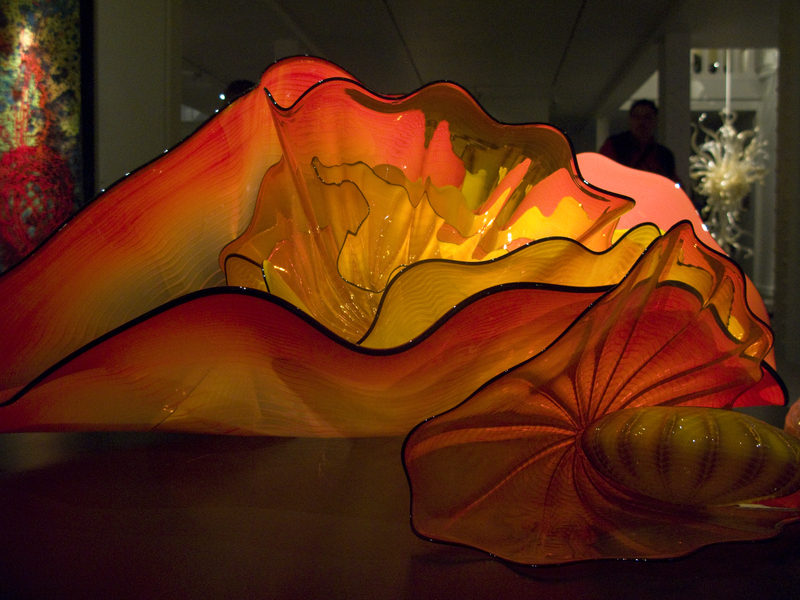 I remember being impressed by Chihuly piece in the V&A main entrance hall many years ago and to encounter more of his work was a treat indeed. The colours where exquisite and on such a large scale, this arrangement filled a room. It felt like you where in a garden or under the sea, expecting a fish to come out from behind one of the shell like shapes. You could not help wondering how would you create this. So delicate and beautiful. I would not want to be one of the gallery assistants putting this exhibition together, disasters would surly happen. Ekk. Last but defiantly not least, Paris 2012/13. A tailored sleek paradise of fine fabrics. Orange and yellow seem to have come out on top colour wise. Waist belts are here there and every where. Pattern still features but in a more refrained matter as they seem to be happy sticking to just the one. This boxy jacket by Veronique Leroy is rather bonny, the bobbly orange pattern against the blue dance together ever so well. Jean-Charles de Castelbajac eagle wings span the breath of this wonderful cape. The Kiora bird and the eagle poke there heads out on shoulders. African inspired prints in orangery red, blue and yellow smatter dresses, skirts and tops to make a wonderful collection. Miu-Miu fell head over heels for the trouser suit this season. In all different colours and head to toe vintage pattern. Louis Vuitton Made use of the print harking back to yester-years and created a glamorous look with a bell boy in toe. The hats remind me of those used in Marc Jacobs New York show this season. Waist belts are everywhere, mainly on the thicker side. Here is Haider Ackermann taken on it. Very futuristic with a sculptured leather skirt. Burnt orange was his favourite colour this season I think, glowing. Alexander Mc Queen wowed everyone as models donning visors and metal waist belts made their way down the catwalk in chiffon frilled master pieces. So delicate, very sea creature like. Frills and pleats at John Galliano made an impact on me. A wash with fur, sheer black material and embroidery. Sophisticated femininity rules strongly. A mis-mash of panels and prints all knitted together I believe by Angelo Marani. This is very cute, girly dress by Luisa Beccaria. The motor cycle print on this blouse by Blugirl is great and reminds me of Prada's retro Americana from last season. The shoes are so cute but get rid of those ear muffs. Jil Sander embraced the pastel colours whole heatedly to creating a very sophisticated feminine collection. Dolce and Gabbana took femininity to a different dimension, using decadent gold braid against black sheer fabric to create a modern yet traditional look. 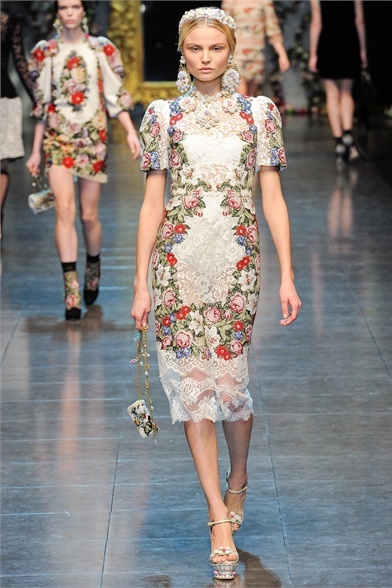 Using a floral pattern this time Dolce and Gabbana create another marvellous collection. Crosses adorned everywhere at Versace. Emilio Pucci executed the little black dress perfectly. Another case of a black sheer dress by Alberta Ferretti. Icebreg's wonderful furry coat with bright blue flecks.